Supertrend is a popular trend following indicator which works particularly well in Intraday timeframe. As a technical analyst, you might have across this indicator quite often during your studies. It is known for its preciseness and accuracy in all the timeframes. It works surprisingly well for all the instruments i.e. equities, commodities and Forex. As it is not readily available in all trading platforms, we have created a macro based Supertrend Indicator excel sheet which calculates the indicator values and buy/sell signal in real-time. The excel sheet is parameterized and works for all major exchanges. 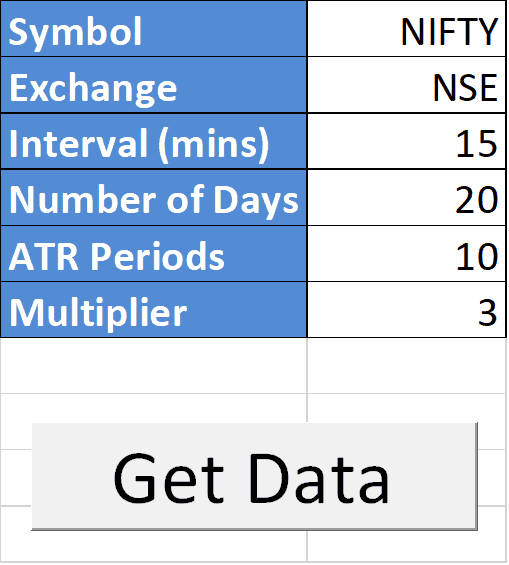 Read through to understand how supertrend is calculated and download the excel sheet from the end of this post. Supertrend is a trend following indicator like moving averages. It is calculated based on Average true range (ATR) and a multiplier value. ATR measures the degree of volatility of the market. A buy signal is generated when Supertrend indicator closes above the price and a sell signal is generated when it closes below the closing price. Looks complex? 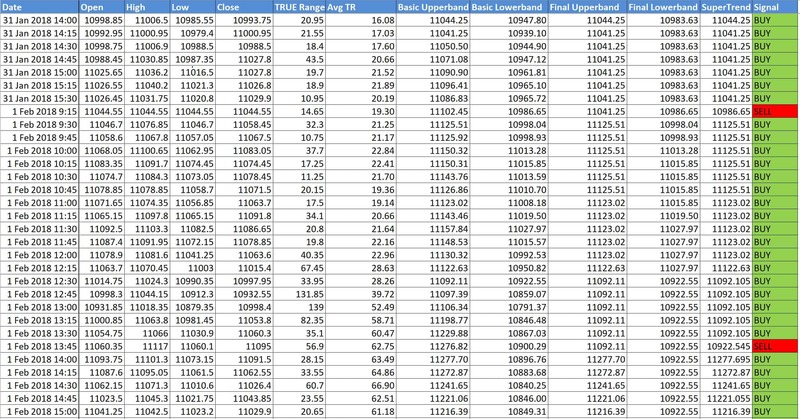 Don’t worry, we have created automated excel sheet which calculates all these values for real-time stock market data. This is an automated macro enabled spreadsheet which calculates Supertrend value and Buy/Sell signals for the symbol entered. You need not to do anything manually. Step 4: Click on Get Data button. The data would be automatically downloaded and supertrend values would be calculated. This data can be downloaded for max 15 days and the minimum interval is 1 minute. Please see the below link to download Supertrend indicator excel sheet. Let us know if you have any feedback or comments. what exchange name used for commodity ? The sheet does not support Commodities currently. I have downloaded the Excel Sheet. Just backtesting I have entered PNB with default value but it has given incorrect signal buy though the stock is in bearish trend. Sir,when is signal generated to trade? This Excel is belongs to NSE Cash or NSE Futures? and i think BUY SELL is showing Wrongly. There is no delay as such. Data is fetched directly from Google and signal is generated on realtime. It has some error because mostly only one direction is appearing mainly of Sell. Thanks admin for giving your precious time in sharing such valuable resources. But I think there are few mistakes in excel sheet, particularly in the formula in supertrend and signal column. I have modified it and it is working perfect now. I would like to share the correct modified sheet if you want. Sorry to hear that you found mistakes in the sheet. Please share the corrected sheet at support@tradingtuitions.com so that we can review, also if you can briefly describe the corrections that you have made. I have mailed the modified sheet to support@tradingtuitions.com . You can check it out. Sir, I hope you have checked out the sheets sent by me. Please provide your valuable feedback to it. And if you found them useful,kindly update the correct version so that others can also benefit from it. Thanks a lot for correcting the excel sheet and adding ATR calculation option. We have updated the same in the post. Thank you so much Sir, for your kind attitude, your hard work and determination. Just now I tried it with markets are closed being a Sunday, it returned – run time error ‘6’. what would be the probable reason ? is it supposed to work with live markets hours ? Can you please try again. I guess the reported error was fixed. Can we use your sheets for US markets.